Research shows that proportional representation is associated with better environmental outcomes as a result of the diversity of voices that are represented, more cooperative decision making, and long term thinking. Frederiksson (2004) found that countries with proportional systems set stricter environmental policies. Cohen (2010) found that countries with proportional systems were faster to ratify the Kyoto protocol, and that their share of world total carbon emissions had declined. In Lijphart’s second edition (2012) of his groundbreaking work on electoral systems and democracy in 36 countries over 25 years, he found that countries with proportional systems scored six points higher on the Yale Environmental Performance Index, which measures ten policy areas, including environmental health, air quality, resource management, biodiversity and habitat, forestry, fisheries, agriculture and climate change. Using data from the International Energy Agency, Orellana (2014), in his book “Electoral Systems and Governance: How Diversity Can Improve Policy Making”, found that between 1990 and 2007, when carbon emissions were rising everywhere, the statistically-predicted increase in emissions was significantly lower in countries with fully proportional systems: only 9.5%, compared to 45.5% for countries using winner-take-all systems. 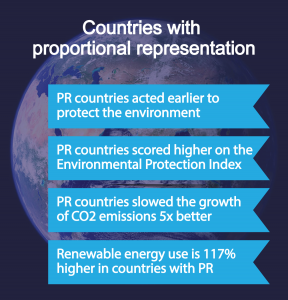 Orellana also found that citizens in countries with proportional representation were more supportive of environmental action, and more willing to pay the costs associated with environmental protection. He found the use of renewable energy to be approximately 117 percent higher in countries with fully proportional electoral systems. Have made 117% greater use of renewable sources of energy. Click here for FVC’s overview paper on the evidence for PR on a wide range of issues. Fredriksson, P. G. and Millimet, D. L. (2004). “Electoral rules and environmental policy.” Economics Letters, 84(2), pp. 237–44. Orellana, Salomon (2014). Electoral Systems and Governance: How Diversity Can Improve Policy Making.New York: Routledge Press (click here to access the summary produced by FVC).